The Southern District of New York found that Cabello did not sufficiently prove that the report included false information, thus making him ineligible for duress. In a 2015 article titled “Venezuelan Officials Suspected of Turning Country into Global Cocaine Hub,” the Journal revealed that American law enforcement officials were personally investigating Cabello – at the time the nation’s second-in-command after dictator Nicolás Maduro – and his ties to the Cartel de los Soles, one of the largest cocaine-trafficking operations on the Western Hemisphere. “There is extensive evidence to justify that he is one of the heads, if not the head, of the cartel,” the article quoted a Justice Department official as saying. The Wall Street Journal is far from the only news source that has reported Cabello’s allegedly extensive drug ties, however, stemming from alliances formed during the Hugo Chávez era. Now a member of the “national constituents assembly,” a parallel legislature Maduro created to strip the democratically elected National Assembly of its power, Cabello is still considered one of the most dangerous socialist operatives in the regime. In addition to the law enforcement sources in the Wall Street Journal report, the newspaper had quoted Leamsy Salazar, a former Hugo Chávez senior security operative who defected to the United States. 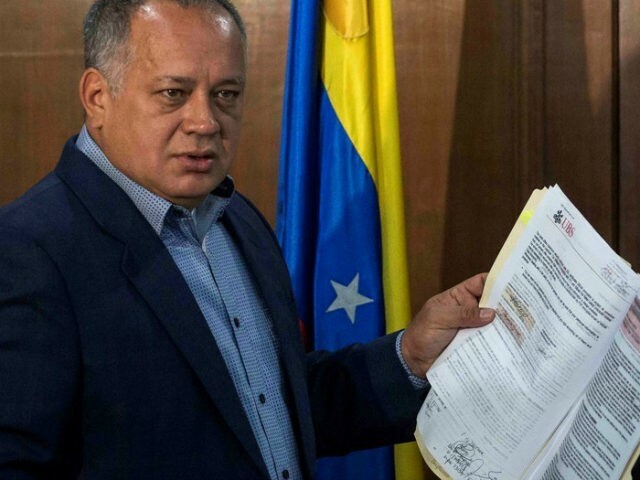 Salazar told reporters he knew Cabello as the head of the Cartel de los Soles in 2015 and offered to testify in any American trial against Cabello. That same year, former assistant secretary of state for Western Hemisphere Affairs under George W. Bush, Roger Noriega, said he also possessed evidence of Cabello’s ties to the group – and the use of drug profits in Maduro’s last presidential campaign – independent from Salazar’s evidence. Francisco Flores de Freitas and Efrain Antonio Campo Flores, the nephews of “First Combatant” and Maduro’s wife, Cilia Flores, told American officials after their 2016 detention that the cocaine they were arrested trying to smuggle into the United States belonged to Cabello. American officials with knowledge of the evidence against Cabello have since openly referenced it when mentioning the socialist leader. Sen. Marco Rubio has referred to Cabello as “the Pablo Escobar of Venezuela” and demanded action to free Venezuela from the Maduro regime. That comment preceded reports that Cabello had sought to hire a hitman to assassinate Rubio, a claim Cabello denied on his television program this week.